this post won´t be long, but it´s the most impressing one so far! I know there are still some people in the scene who do not believe that this Samba will ever hit the road again. Well, tonight I received some pictures right from England that should convince even the last disbelievers. 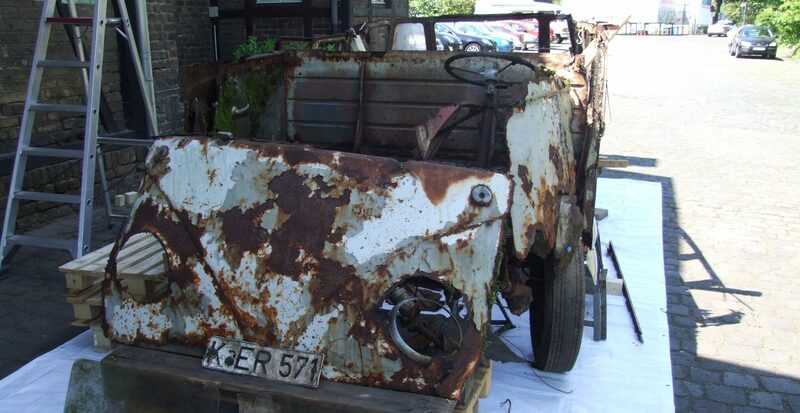 Just have a look at this and now tell me you are still thinking this project won´t be finished as announced…..
Can´t wait to bolt on the Samba´s front bumper here and fix the surviving front license plate! 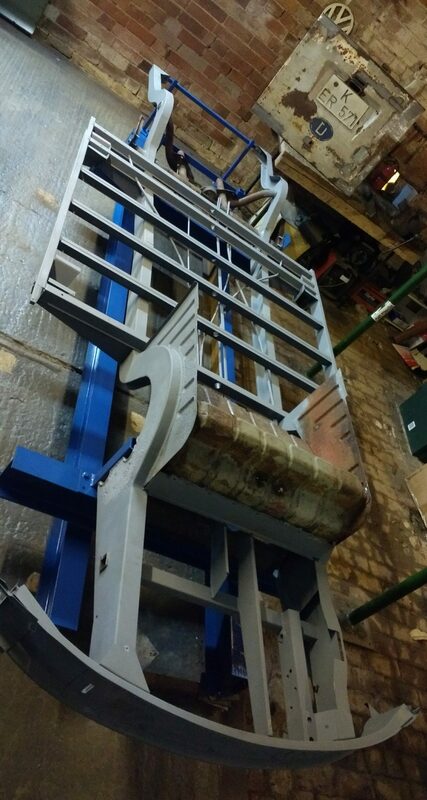 Look how elaborately Mark fitted in the surviving parts of the chassis into the new frame he just constructed. Watching these pictures encourages me to announce to the public, what Mark told me weeks ago. 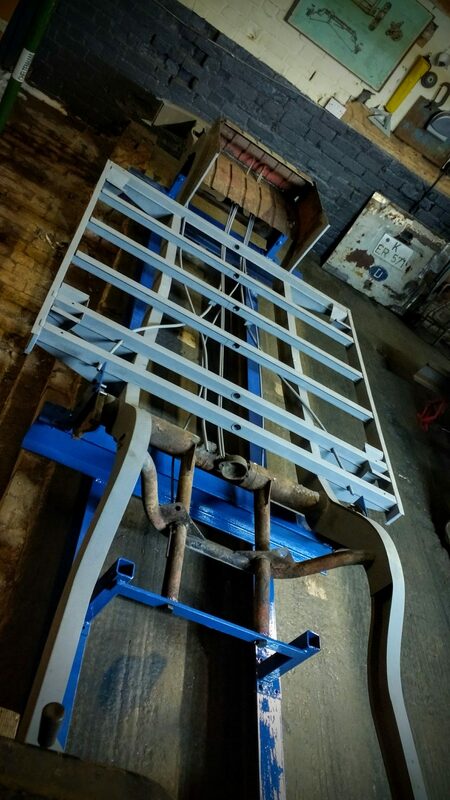 We will be able to bring this chassis ROLLING to the Barndoor Gathering in Amersfoort this May! The gearbox and the steering knuckles are in Hessisch-Oldendorf at Christian Grundmann and his great mechanic Marcel. Both of them promised that gearbox and steering knuckles will be finished in time. The front axle beam should be already in England on its way to Mark. The rear shocks are in Poland at Jacek Krajewski who told me he will finish this job next week (I will share with you an extra post about the rear shocks). The front shocks I will repair by my own end of next week (post will follow very soon). The wheels are in Sofia for a paint job, what shouldn´t be a problem at all. Hhhhmmm, I just realized that I need some tires. But to buy now a set of new brand tires wouldn´t be smart as there will be some years until the Samba is really completed and ready for its first ride. Letting some new tires ageing for nothing would be stupid. So is there anybody out there who can spare with us a set of used 16”-tires just to bring the chassis rolling from England to Amersfoort? Come on, guys! Be part of a great story and write me if you could help by donate some old tires you couldn´t use for regular driving anyway! Great update. That is a very impressive jig that UK Mark has created. Good luck finding a four 16″ skinny tires. I am unable to help given I am millions of km from you. Very impressive work between you and Mark. I also am impressed by the display of proficiency and knowledge of Volkswagen bus construction. Incredible work here from Mark and you, and amazing way of telling the stories! Keep up the great work! Fascinating! Well done, Mark, Florian and all helpers out there.